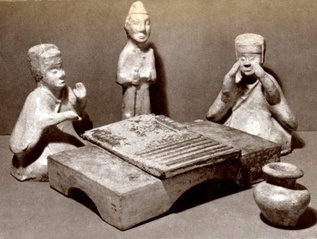 The Roman and Chinese peoples played various kinds of games and musical instruments. 1. A Roman dice game. 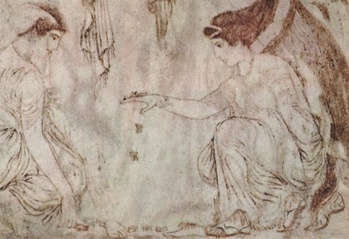 Detail of a painted marble showing Roman ladies playing knucklebone, a dice-like game coming from the Greeks. Found in Herculaneum. 2. A Chinese board game. 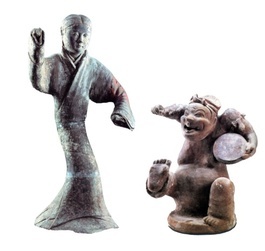 Glazed pottery figures showing the game of Liu Po, a board game in which pawns are moved along fixed routes. From a grave of the first or second century. 3. Roman flue and harp. 4. Chinese horn and rattle. 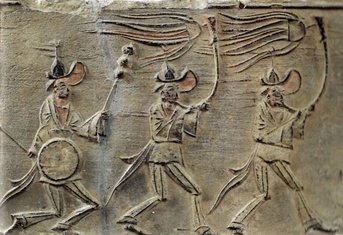 Detail of a brick relief showing musicians in a funeral procession. Two are playing long curved horns with streamers, followed by a third playing drum and rattle. (North Dynasty). 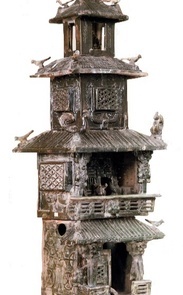 Bronze bells were a courtly instrument for the feudalistic aristocrats of pre-imperial China. Each bell can produce two tunes when struck at difference places. This set of 64 bells covers about five octaves. The largest bell is 60 inches high, weighing 450 pounds. (Warring-states period, Hubei). 6. A musical band for gladiator shows. 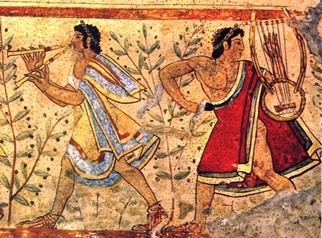 Musical performance accompanied gladiator shows. 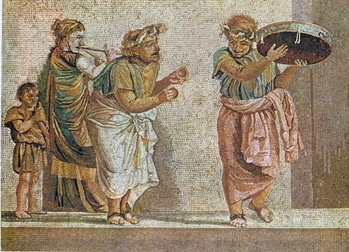 This detail of a mosaic shows a trumpet player, a water organ player, and two horn players. (Leptis Magna, North Africa). The Greeks and Romans built open-air theaters in which the audience sitting on stone steps faced a large stage. 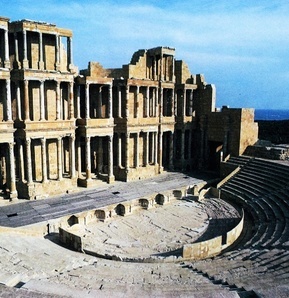 This one is at Sabratha, Lybia. Pottery model showing five performers on the second-floor stage. The building is topped by a drum tower. Latter Han. (Guoyang, Anhui Province). Itinerant actors wearing theatrical masks and performing dance, music, and mime. Mosaic from Pompeii. (Archeological Museum, Naples). 10. Chinese dancer and story teller. 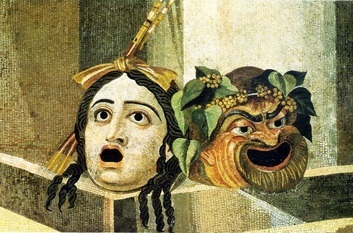 Masks for tragedy and comedy. (Detail of mosaic, Capitoline Museum, Rome). Two expressions of storytellers. 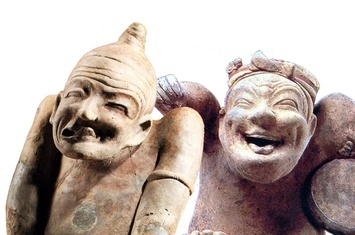 (Pottery figures, Sichuan Provincial Museum). With gladiator combats, chariot races, and other circuses, the Roman Empire was unsurpassed in public entertainment. Ruins of the Colosseum and numerous amphitheaters remind us of their grandiose scale. Although much more modest, the Chinese too enjoyed public performances, especially in acrobatic. 13. 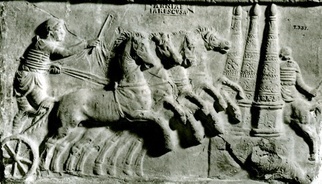 A Roman chariot race. 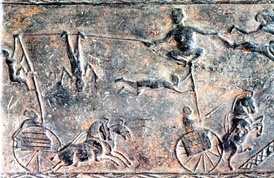 Brick relief showing men performing stunts on a high wire strung between poles erected on two separately racing chariots. 15. Death by being eaten alive. 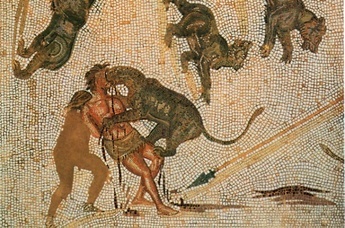 Mosaic showing damnation ad bestias, wherein a prisoner is eaten alive by wild beasts. From El Djem, Tunisia. Late second century. 16. Chinese acrobats and jugglers. 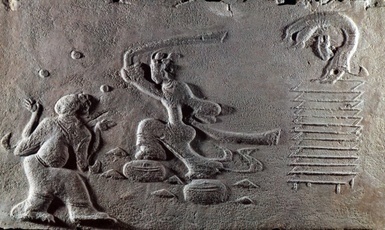 Brick relief showing acrobats and jugglers.